Novosibirsk and Moscow, Russia: February, 28, 2017 — LEDAS Ltd., a leading provider of software development services for the CAD/CAM/CAE/PDM/PLM market, and C3D Labs, a subsidiary of the ASCON group of companies and the commercial developer of the C3D Toolkit, today announced the successful integration of their products. The LEDAS Cloud Platform (LCP) was bridged with C3D to achieve better performance and quality when working with real-life user models. Before this, LCP had already been coupled with an open-source B-rep geometric kernel and 3D modeling library, so that the new integration was achieved smoothly and in a short timeframe. This proved that LCP can be easily bridged with any general-purpose geometric modeling kernel. LEDAS Cloud Platform provides most popular and most requested cloud capabilities — data storage and management, 3D visualization, communication and collaboration — by bringing them to users through Web browsers. 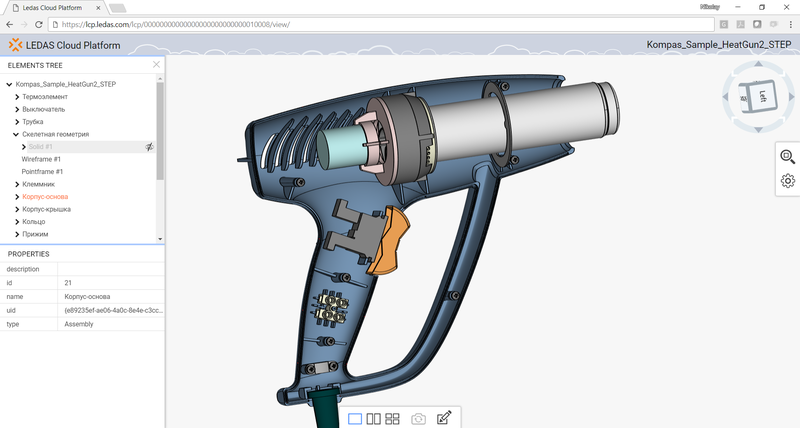 Several applications have been developed on the LCP platform to deliver even more complex and specific user functions, such as editing and analyzing 3D models on the Web. These applications were developed much more quickly than usual thanks to the added value of LCP available to licensees. LEDAS, as a long-time provider of software development services, is able to develop any features requested by customers. 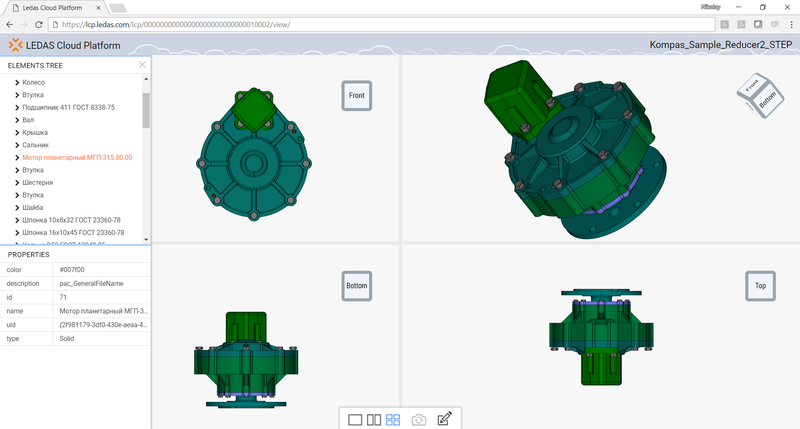 The main functions that LCP needs from a 3D kernel is to read and tessellate CAD data into triangular meshes, which are used on the browser side for visualization, navigation, mark-up, and other user interactions. By employing additional data structures, LCP maintains a map between triangular meshes and CAD data, and provides a bi-directional work flow between client and server. Operations done by users on the client side trigger corresponding operations on server side, which modify the 3D model accordingly. Once all operations are done, the CAD and mesh models are saved in users’ spaces on cloud data storage sites for sharing and later reuse. "We have a long-term partnership with LEDAS, which embodies development, reselling, and several joint marketing activities," said Oleg Zykov, CEO of C3D Labs. "Some of our customers and partners have expressed their interest in the LCP platform developed by LEDAS, and so we consider this integration an advantageous step up in the market. The results demonstrated that the performance from the integration of LCP using our commercial C3D Toolkit — which includes the geometric kernel, a data format converter, and other components — is much better than using open source kernels, if a licensee is really interested in quality and speed. The licensing conditions of C3D Toolkit and LEDAS Cloud Platform are quite flexible and attractive not only for well-established companies, but also for ambitious start-ups." LEDAS’ success stories include significant projects for Dassault Systemes, Cimatron, Bricsys, and ASCON. These and many other companies have put innovative products on the market using R&D services from LEDAS. More information about LEDAS is available at www.ledas.com. For more information, please visit www.c3dlabs.com.